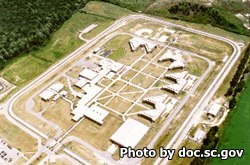 Allendale Correctional Institution is located in Fairfax South Carolina. It is a medium security prison that houses adult male offenders. Currently this facility houses approximately 1,221 inmates even though it has an operating capacity of 1,185. Inmates at Allendale Correctional Institution are primarily housed in double bunked cells. Additionally, this facility has 136 triple bunked beds. Allendale Correctional Institution has two character based housing units reserved for inmates who display a high level of positive behavior. Programs at Allendale Correctional Institution include a bee keeping program that teaches the inmates the basics of making honey, a quilting program, an addiction recovery program, and a program that allows offenders to work training dogs who are up for adoption. Inmates who do not currently possess a diploma can take adult basic education classes and earn a GED during their incarceration. Visitation at Allendale Correctional Institution occurs on Fridays from 6pm-8pm and on Saturdays and Sundays from 8am-12pm and 1pm-5pm. Inmates are also allowed to have video visitation provided through GTL. To register and schedule a video visitation start here.